Adobe is rolling out updates to several of its apps with a new artificial intelligence ‘Enhance Details’ feature. The feature comes as part of the February 12th update to Lightroom Classic CC, Lightroom CC and Adobe Camera Raw for Mac and Windows. It uses machine learning to improve resolution and picture quality in zoomed in images. Adobe claims the tool can increase the resolution of individual images by up to 30 percent. While that may sound like a lot, often the improvements aren’t as striking as you expect. Enhance Details comes into effect in the ‘demosaicing’ process. This process happens during the creation of a digital image when the camera adds colour to the original monochrome file. Typically this is done using an algorithm, and since there’s no one way to do it, different camera makers do it in different ways. Adobe’s feature adds machine learning to the mix. The company trained a demosaicing algorithm with a massive dataset of over 1 billion images. Enhanced Details learned the best way to colour images, which resulted in a slight improvement to picture quality. While the results certainly look better, it’s not nearly as intense as the ‘zoom and enhance’ tropes on display in some crime shows — tropes so ridiculous, they’ve spawned a variety of memes and parodies. You can see the results in the above GIF and the comparison image below. To use the feature, you’ll need a computer running on macOS 10.13 or Windows 10 version 1809 or later. Additionally, you’ll have to use the RAW image format. 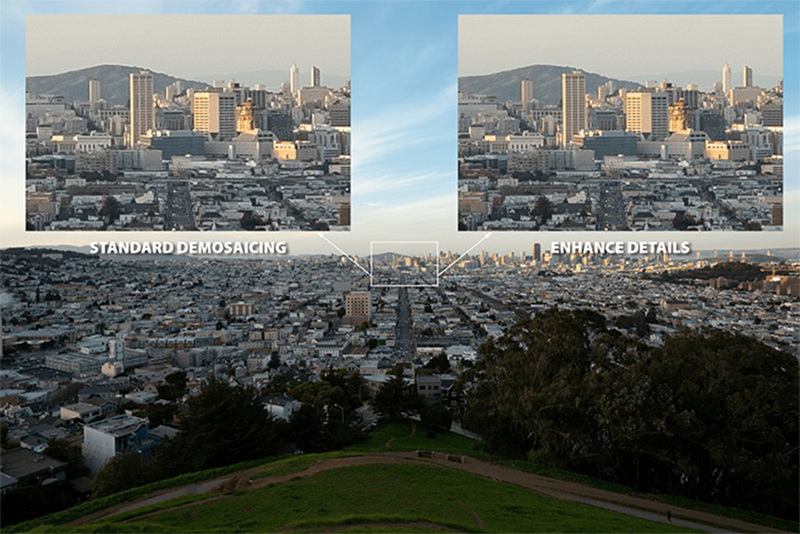 To learn more about how Enhance Details works, you can check out Adobe’s blog post here.